Just as every website needs a redesign over time to look fresh and new, a marketer’s content requires similar tune-ups. As business and customer needs evolve, and search engines tinker with their algorithms and set new rules of engagement, conducting a regular audit of your content is both necessary and required. Our colleague Jasleen Kals joined executives from the Content Marketing Institute recently on a webinar to discuss the benefits of regular content audits. In this installment of Memo to the Modern Marketer, we’ve distilled some of that talk and supplemented it with additional content to offer our advice on how to conduct regular content audits in five easy steps. As with any marketing initiative, the purpose for your content audit should be focused and aligned with your content marketing strategy. That means you must know who you are targeting, what your brand story is, the channels where you want to tell your story, and how you want to tell it. The audit should be focused because there’s a lot of data that you can look at, but you should only collect the data that is relevant to your goals to avoid wasting time and energy on information you won’t need. Altogether, this information will help you figure out how you should distribute your efforts. The more detailed your purpose is, the more effective your audit will be. Much like an audit done by the IRS, a content audit requires a lot of data collection and bucketing the information into an Excel spreadsheet or Google Sheets. It is a big undertaking; some companies have thousands of pages to sift through. That sorting may require outside help. Smaller companies won’t have as much to process, but it’s not an overnight job — some audits take months to complete. While a cursory audit is better than no audit, it’s best to do a full audit, because once it’s done, it will only require regular maintenance to keep your site visible. Start by making a list of all your content assets. There are free tools like ScreamingFrog.com that automatically crawl your site and sort information. They put together a list of all your URLs along with meta descriptions, meta keywords, H1s, H2s, etc., neatly break the categories and arrange them in tabs for a CSV to be exported or uploaded and analyzed. You can also create a list using the Searchmetrics Suite. For each Searchmetrics project, you can pull the URLs that are crawled, and it will rank the URLs by performance. Here we’ve crawled the blog for mattress company Casper. You probably already know who you are targeting, but here you want to use knowledge of who your content is actually reaching. Blend that user persona with your target audience to develop new personas that guide you toward effective content marketing. This is where you want to examine your Google Analytics data. The above list can be exported into a CSV or XLS to be uploaded into Google Analytics for the and an in-depth review of demographics: information on the age and geography of your audience; what your audience is interested in; how they’re taking in the content; how they’re interacting with your content on social media; and at what point they jump out of the content marketing funnel. Content Type – blog post, FAQ, testimonials, product description, etc. You can include items like target keyword, broken links, word count, number of social shares and page visits. How much you include will depend on your goals, but the more detailed your audit is, the more informed you’ll be as you update your content strategy. Here, one of the most important items to identify is duplicate content. Content that is duplicated on multiple pages across a site will result in the pages competing against each other on the SERPs. It confuses search engines and could result in no ranking at all. You’ll also want to identify any “thin” or “shallow” content that does not provide the depth or breadth that a searcher is looking for. One concern about duplicate content is the FAQ page, which can be helpful for boosting a page rank and increasing chances for being included in a “featured snippet.” For this situation, the FAQ page should be re-written to make it unique from other content on your site while maintaining the valuable information. The strategy behind this is to get rid of the content that prevents your site from performing well. That content — the deadweight — is using up time and the number of pages Google earmarked for your site to crawl. It’s like getting rid of apps on your smartphone that you don’t use much but are taking up valuable gigabytes that you’d rather use on a new, more useful app. Deadweight is content that doesn’t get any traffic, is no longer relevant to your business, outdated, or would not provide any value to a site visitor. If you need to delete a page, you should either add a “301 redirect” to another URL or a “410 content deleted” header to make it easy for search engines to figure out what to do with it. Deciding what to remove is not always easy. For publishers and high-ranking sites like Forbes that have a lot of old content that they want to keep, you can manage the crawl budget by adding “no index” tags to those pages to tell search engines not to include them on results pages. This way, the information is still available, but ranking for new information isn’t damaged by the old content. Content inventory takes a lot of time, as it requires going through each piece of content to review its relevance. Also, with every search engine algorithm change, it typically dictates an adjustment in keyword strategy and optimization that may be outdated even if the content appears to be evergreen. Additionally, inventory provides an opportunity to look back and make sure there weren’t any questionable SEO tactics or black hat tricks used on old content that could be affecting your visibility now. Analyzing your metrics requires a good eye and attention to detail to uncover underperforming quality content that could be amplified with a new title, a keyword refresh – or could be rewritten. From your overall list, you can review types of content and the quality of your digital assets for each phase of the content marketing funnel. In addition to the data you’ve packaged into spreadsheets, you’ll also want to look at your overall visibility and pit it against your competitors. This will help you identify patterns where you and your competitors are winning and losing, and find gaps that you can fill to outperform your competitors. 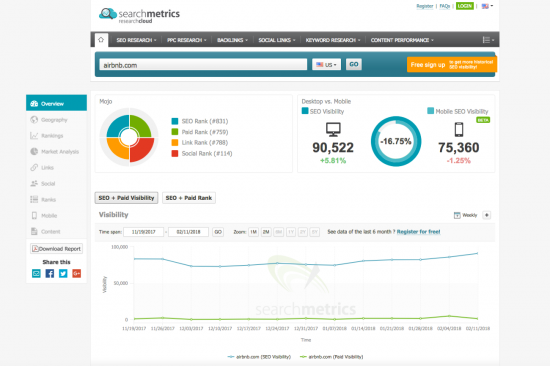 With the Searchmetrics Suite, you can compare the visibility between competitors. In this graph, you can see how Casper’s blog performed next to the blog of mattress producer Helix Sleep over the last year. This is a pretty dynamic example — success for both brands goes up and down; there are even a few points where the lines cross and the performance positions switch off. If you were running the blog for Casper, you’d want to examine the dates for the sharp increases and drop offs in content performance to see what kind of improvement can be made for individual elements — with this, you could determine what content and keywords are related to the dips and spikes, and then note those in your audit spreadsheets. Additionally, you can figure out which keywords you should start trying to rank for that your competitors rank highly for. In the image below from the Searchmetrics Research Cloud, you can see the number of keywords each of the same two mattress companies rank for. The two bubbles don’t overlap, so you know they don’t have any shared keywords. 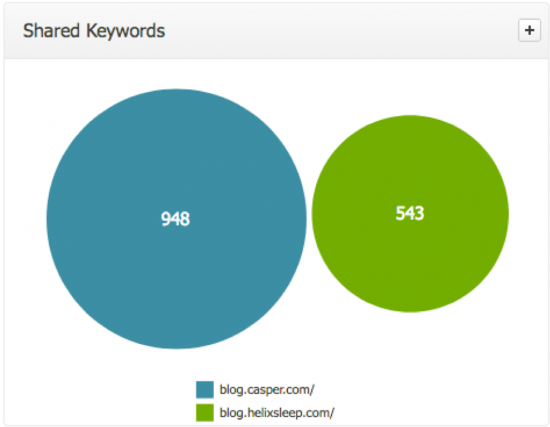 With that in mind, Casper might want to look at keywords Helix Sleep ranks for, and start creating fresh content around them. Now it’s time to tackle your content strategy. If you started the audit before setting your content strategy, you can base your strategy off of your findings. If your strategy is already in place you can make adjustments to the strategy to reflect the information from the audit. It should help guide you as you put a process in place for content ideation, research, writing, editing, releasing, etc. When you’re setting up your tracking, one of the most useful tools you can invest in is a keyword ranking tool. No matter what size company you have, a ranking tool, in addition to analytics, can be an invaluable asset. Ranking tools allow you to tag the keywords you already rank for, along with the ones you want to rank for. You can then bucket them by category and page. With this, you can monitor how content updates impact your site so you can make changes to prevent any negative issues that could become big problems later. This can be a tedious process if you have a robust list of keywords you are working with. 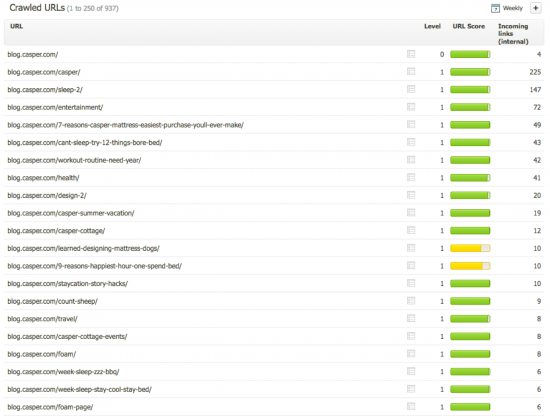 In this case, you can track the most important keywords you want to rank for. If you’re just starting out in content analytics, you’ll want to review the information for content inventory that you gather from Google Analytics. There are a number of metrics you can be tracking, but they should be determined by the marketing goals you set. Jasleen got a lot of great questions during the webinar but couldn’t get to all of them. We’ve posted answers to the ones we weren’t able to cover below. If you have more questions, let us know what they are in the comment section. 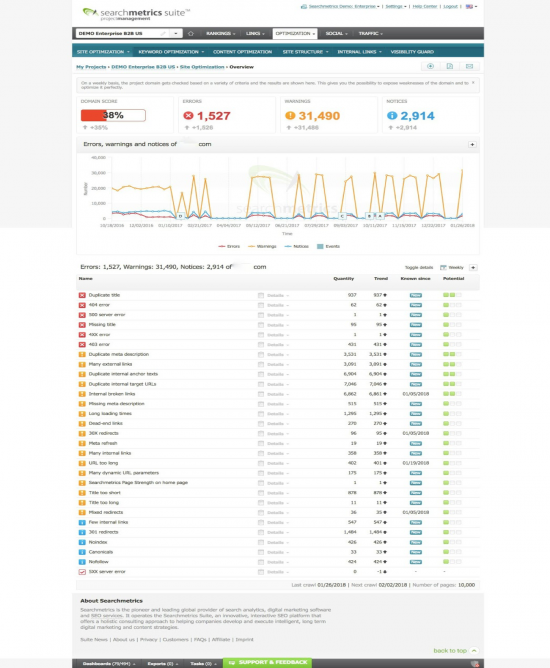 Q) What’s the difference between Content Audit and Content SEO? The idea of a content audit is to go through all your content as a full inventory on a domain level, and then do an audit (add more content where you have a gap, remove duplicate or unnecessary content) based on quality of your content. A good content strategy requires unique, interesting and quality content. You can do a content audit based on a specific term as well. While a general content audit focuses on quality, an SEO content audit will concentrate on more technical aspects such as duplicate content or missing meta tags. Content SEO on the other hand is creating content that is targeted to attract organic traffic. This is practiced by an extensive keyword research within the specific content, including competitors, and then optimizing determined key words by deciding how to use them and where to add them (titles, videos, alt texts, social posts, etc). Finally, you organize the created content in a user-friendly way. Also note that SEO content strategies won’t help much unless you have a quality content. Content creators should optimize as they write by providing keywords to include, word count, readability and an overall content score that represents how well the keywords are being used within the content. Q) In analytics, which metric is better to use to check if a blog post is performing well? Google Analytics and most analytics programs will collect information on “page views,” average time on page, entrances (the number of visitors who got to your website through the post), the bounce rate (the rate at which visitors left the website after reading one page) and exit rate (the percentage that left a website viewing session after viewing that particular post). Q) What is the best resource to learn about using Excel/Google Sheets as part of your Audit Toolkit? Q) How do I know what content my online customers are looking for? If you’ve done thorough research on the personas you want to target, you should have a pretty good idea of what they’re looking for. However, you can collect a lot of information after you’ve started producing content. By using analytics tools like Google Analytics, you can see which pieces get higher traffic compared to your other content. Another indication is the engagement levels; high engagement for a piece of content is a good sign visitors are looking for that type of information. After checking out your own content, you can research and see what people are actually talking about in your industry by looking at industry hashtags on social media (for example #SEO, #contentmarketing, #search) or by looking at trending topics — Facebook, Twitter, and Linkedin all post trending topics in their feeds. Google even posts the topics that people are searching for most at any given time. Q) When optimizing content, how much time does it need to see results? It depends on the elements of the optimization. You can see the results in a short amount of time if you are dealing with technical cleansing such as removing duplicate content, reorganizing your topics, adding meta tags etc. This is a matter of a crawler indexing your pages. However, for a long-term strategy, optimizing content could take months – even years. This is an ongoing process that should be improved constantly as you try to gain domain authority. You need to build up trust and create unique content with your team of writers. Analyze what your customers need, do extensive keyword research, check competitors and market, create content, pitch it in every possible way, track metrics, audit, re-strategize and start over again. Q) Does PDF content count as a duplicate to on-page content? Q) Is the Searchmetrics Suite Research Cloud is available to everyone? You can see a short summary of an analysis of a domain with Research Cloud without subscribing to our services. The image below shows some of the information we can uncover. Q) Can you talk about the value of using a ranking tool vs. Search console? Search console basically helps you identify which keywords your customers are searching to find your website and some other important metrics, such as CTRs. Also, it helps to see your crawling errors, site maps, meta data information or duplicate content. Ranking tools, on the other hand, is more keyword-oriented, which will help you prioritize your SEO strategy, check out your competitors or see potential traffic of a specific keyword. You can see potential improvements without even implementing any strategy which will save you excessive amounts of time learning by trial and error. Q) I could not get screaming frog to work correctly, and could not find any resources to help me figure that out. Do you have anything that would help with a sitecrawler tool? Searchmetrics also provides site crawler services that are easier to adopt than screaming frog. Below is an image of the errors for a major software company after Searchmetrics performed a crawl. Q) I’ve seen clients rank for MORE keywords after a content update, keeping their average ranking the same, but their most important keyword rankings improved. How do you propose making sure the average keyword ranking is accurate for their desired keyword? The best solution is to use trustworthy ranking tools. Q) Are there companies that will do the initial audit for you? Can you recommend any? There aren’t any specific companies we recommend, but Top SEOs has what it considers the best site audit companies ranked.